Anyone who spends time beside the sea knows there’s a wealth of ‘treasure’ to be found, be it natural or manufactured, living or washed up. 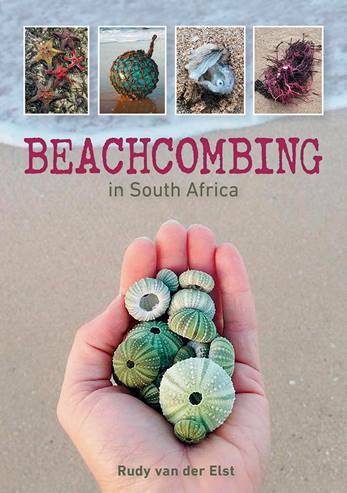 Beachcombing in South Africa by Rudy van der Elst is a friendly guide to the seashore’s rich pickings. Short chapters such as Floaters and drift­ers, Sea-beans, Sponges, Eggs and egg cases, and many more, detail what can be found and how to interpret or identify specimens. Items may reveal links to activities or biological events in the nearby ocean – or, perhaps, thousands of miles away. They may relate to human activities, such as fish or bird tagging, or be oceanographic instruments separated from their moorings. Or they may be part of the growing menace of flotsam and jetsam from the planet’s burgeoning human population. This book will enhance the experience of beachcombing, satisfy curiosity about finds, and contribute to a better understanding of the life in our oceans and along our shores. The book is aimed at a wide audience of beach strollers, dog walkers, anglers, bird watchers and families who share a fascination with the seashore and its treasures. Rudy van der Elst is former director of the Oceanographic Research Institute (ORI) based at Durban’s uShaka Marine Park. He has lived and worked near, on or under the sea since his student days, and is one of the leading authorities on the marine fishes of southern Africa. Now retired, he lives in Mossel Bay where he continues to enjoy the coastline and its treasures.